Historically, translation has played a crucial role in ensuring the survival and revival of Buddhism. 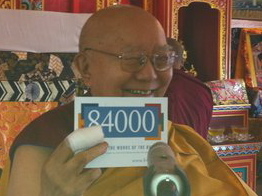 The living traditions of Buddhism that still exist in some parts of the world, such as Japan, China, Korea, Tibet, Bhutan, Thailand, Sri Lanka, and Burma, have survived in large part because of the foresight of our ancestors who compiled and translated many of the original texts into their own languages. Pali and Sanskrit were the first languages in which collections of the Buddhist texts were compiled. The Pali texts had been taken to Sri Lanka and survived, but most of the Sanskrit texts were lost when the great Buddhist culture of northern India was destroyed by Muslim invaders between the 11th and 13th centuries. Fortunately, by then most of the texts had already been translated into classical Chinese and Tibetan. The classical Chinese translations started in the 1st century as Chinese pioneers and Indian scholars began gradually to introduce Buddhism to China. The classical Tibetan translations followed later during the unparalleled state-sponsored cultural transfer of the Buddhist teachings into Tibet from the 8th century onwards. The Tibetan collection contains a large number of texts not found in the Chinese canon, particularly tantras, and there are a smaller number of texts in Chinese that do not exist in Tibetan. To ensure the continued survival of these timeless texts, and to make the profound meanings they contain accessible to all, they now need to be translated into the languages used in the world today.